Until recently you ventured to West LA's Sawtelle Avenue for one reason: Japanese fare. Delicious Japanese fare, but only Japanese fare. Over the past few years though, there's been a slow, yet noticeable, if not momentous, shift toward a more balanced cuisine on the famed street. It started with fine ramen, then burgers with Plan Check, and then expanded recently with Korean sausage. Sort of lost in the shuffle was the recent additions of two potential noteworthy pizza joints: Clusi Batusi and Slicetruck. If you've ever read U.E. before, you know I dream of pizza all day long. Thus, I simply had to know: is it possible that Sawtelle Blvd. now features pizza worth passing up quality cheap sushi and Tsujita noodles for? 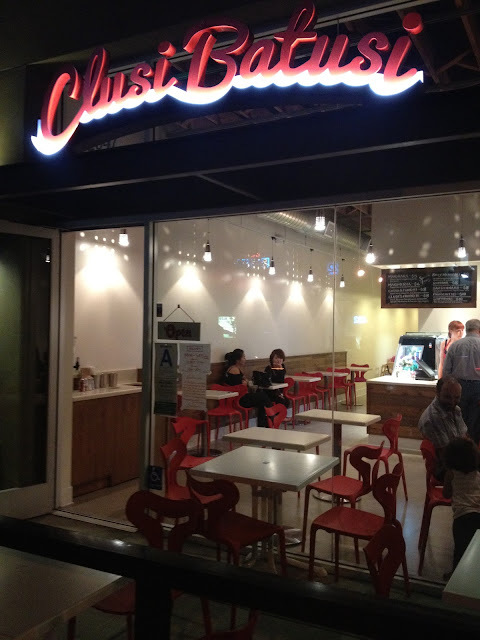 CLUSI BATUSI - 2047 Sawtelle Blvd. Due to the overwhelming success of Westwood's 800 Degrees, it was only a matter of time for so-called quality fast casual pizza imitations to pop up city-wide. And while in the restaurant game mimicking rarely results in strong product, from time to time the brothers from another mother hang tough - for example, Kogi's delicious imitator Komodo. Sadly, I don't think Clusi Batusi is LA's next pizza equivalent of Komodo. Although Clusi Batusi prides themselves in making their own toppings and dough -- they're closed Sundays for "dough making," according to their website -- I found the whole pie to be rather dull. The crust is thin, yet too doughy in taste. The pesto is nothing special. The balsamic mushrooms were probably the star of the pizza, but more would have been nice. And as you can clearly see in the picture atop this post, their so-called "oven-dried tomatoes" are the same boring sun-dried tomatoes you can get the town over. To make matters worse, my $1 extra paid for the tomatoes resulted in single digit TINY strips. Now, for $8, was this a horrible pizza? Absolutely not. The pizza certainly filled me up and offered some interesting toppings and, in doing so, could become a popular Sawtelle destination. The chopped salad we ordered was adequate enough as well. But, Clusi Batusi lacks the transcendence 800 Degrees provides with its affordable pizzas. At 800 Degrees, you don't feel skimped on toppings, you think the salads are a bargain and you leave the place as fast as you can because you feel like you just robbed them. At C.B., you simply get what you pay for. 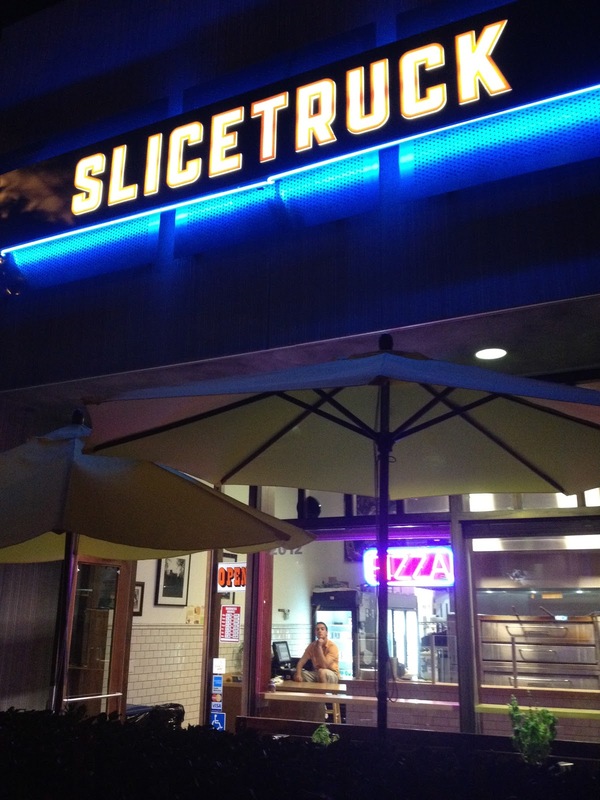 SLICETRUCK - 2012 Sawtelle Blvd. My fellow blogger Midtown Lunch LA already has pointed out the inanity of The Slice Truck naming their first brick and mortar, SliceTruck, so I will just skip past that and delve right into the pizza. Like many people, I really, really did not like the pizza coming off the Slice Truck. It really was a very disappointing effort. With this in mind, I was pleased to hear from many sources that they had really upped their game at their restaurant. After sampling a slice, I will admit they definitely have improved their 'za. Although the crust remains a tad cardboard-y, it's much softer and tastier than the truck version. The sauce is much, much fresher as well. The cheese isn't bad either. And they top the whole thing with freshly grated parm and a handful of basil. But... just because I said this was an improvement, does not mean it will be making any Top 10 lists any time soon. Overall, it's an average slice - one similar to hundreds available in our fair city. Also, unlike their pizza neighbor across Sawtelle, the somewhat hefty SliceTruck prices do not match the quality of product. ((Also of note: they use the thick pepperoni, which may be authentic, but is too chewy for my liking)). OVERALL: As you can tell, I was a little letdown by the two new Sawtelle pizza joints. It's not that Clusi Batusi and SliceTruck aren't good, it's just that, unlike the eclectic Blvd in which they're located, nothing at either joint differentiates itself from the vast LA pizza landscape. This, however, is a first impression and I will most certainly return. I look forward to trying C.B. 's red sauce and SliceTruck's garlic pizza that Midtown Lunch seems to adore (especially since The SliceTruck's website currently offers 20% Off). Until then... stick to the sushi. Now there's a good idea - combine Italian and Japanese food. Next thing I know, the local catering bristol serves something like sushi pizza.